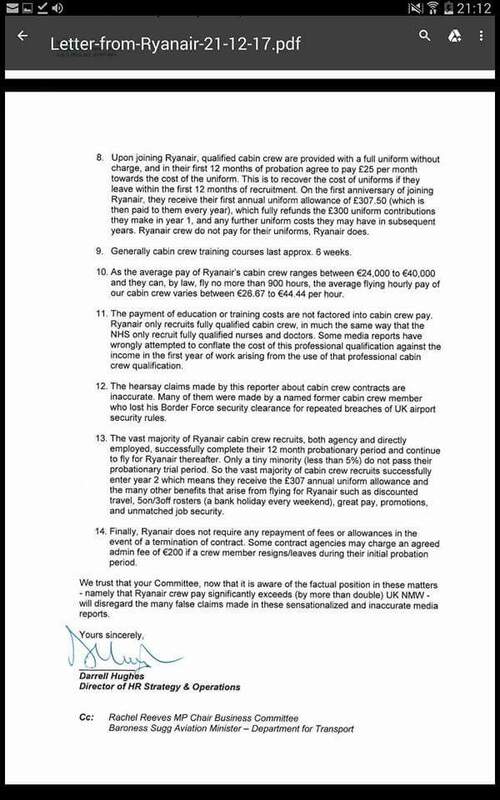 BEFORE YOU BOOK YOUR NEXT RYANAIR FLIGHT READ THIS.. Ryanair's letter to the Rt Hon Frank Field MP in December 2017 can be seen below. Ryanairdontcare Campaign was set up in 2009 after my 18 year old Daughter was terminated after a seven week period being probationary cabin crew, contracted through a Irish registered company called Crewlink..To this day I still believe she was recruited for the sole purpose of Termination.After many years being involved and having resurched Ryanair probationary cabin crew recruitment through Crewlink Ireland, St James Management, Cavok and Dalmac's Workforce International, it is clear to me Ryanair since 2004 have recruitment scammed thousands of young wannabe cabin crew all over Europe as a way in making multi €millions each year. Currently Crewlink Ireland and Dalmac's Workforce International are the only companies given out Ryanair probationary cabin crew contracts. There are two type's of cabin crew contracts at Ryanair. RYANAIR CONTRACTED CABIN CREW CONTRACT Mainly no1 cabin crew supervisor on board each aircraft of 4 cabin crew. CREWLINK /WORKFORCE INTERNATIONAL CONTRACTED CABIN CREW CONTRACT.2,3 and 4 cabin crew on board each aircraft. RYANAIR CONFIRM 8000 CABIN CREW. 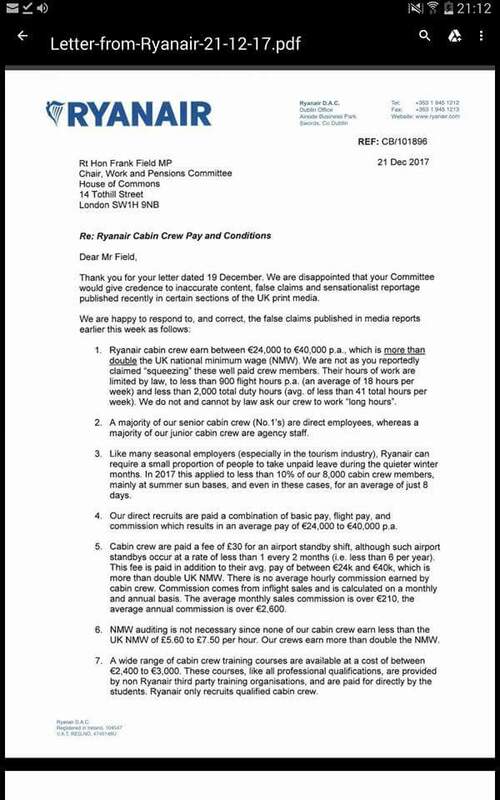 .. RYANAIR CONTRACTED CABIN CREW Numbers 1000+ CREWLINK CONTRACTED CABIN CREW Numbers 5000+ DALMAC'S WORKFORCE INTERNATIONAL CONTRACTED CABIN CREW Numbers 1500+ Ryanairdontcare Campaign's reply letter to Ryanair's letter sent to Rt Hon Frank Field on 21 December 2017 as follows. 1, RYANAIR CONTRACTED CABIN CREW DO EARN €24,000 TO €40,000 PER YEAR.THE NUMBERS OF CABIN CREW THAT RECIEVE THIS SALARY ARE 1000+ THE AVERAGE MONTHLY FLIGHT TIME SALARY PROBATIONARY CABIN CREW EARN IS €700 to €1200, NOT INCLUDED SALE COMMISSION. YES BY LAW CABIN CREW CAN ONLY WORK 900 HOUR FLIGHT TIME A YEAR BUT CAN WORK UP TO 2200 HOUR IN FLIGHT TIME /DUTY TIME TOGETHER. RYANAIR CONTRACTED CABIN CREW ARE PAID FOR THE TOTAL 2200 HOURS BUT CREWLINK/DALMAC'S WORKFORCE INTERNATIONAL CONTRACTED CABIN CREW ARE PAID O LYING FOR 900 HOURS FLIGHT TIME..CREWLINK HOLD 5000+ PROBATIONARY CABIN CREW CONTRACTS WITH DALMAC'S WORKFORCE INTERNATIONAL HOLD ING 1500+ PROBATIONARY CABIN CREW CONTRACTS. 2, JUNIOR RYANAIR CABIN CREW ARE ALL CONTRACTED THROUGH CREWLINK / DALMAC'S WORKFORCE INTERNATIONAL. BEING 6500+. 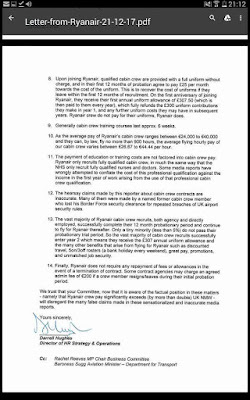 5, RYANAIR CONTRACTED CABIN CREW ARE PAID DUTY TIME PLUS £30 FOR AIRPORT STANBY SHIFT OF 8 HOURS. CREWLINK / DALMAC'S WORKFORCE INTERNATIONAL CONTRACTED PROBATIONARY CABIN CREW ARE PAID £30 FOR AIRPORT STANBY SHIFT OF 8 HOURS AND ALL AVERAGE 2 HOME STANDBY SHIFTS A WEEK WHICH IS NOT PAID. One point I must point out which shows how bad Ryanair are towards probationary cabin crew. IF A CREWLINK /DALMAC'S WORKFORCE INTERNATIONAL PROBATIONARY CABIN CREW MEMBER IS ON AIRPORT STANBY SHIFT AND IS CALLED TO COVER A LAST FLIGHT OF 1 HOUR THEN THEY RECIEVE THE HOURLY RATE OF PAY AND FORFIT THEIR £30 .AVARAGE SALES COMMISSION FOR CREWLINK /DALMAC'S WORKFORCE INTERNATIONAL CONTRACTED PROBATIONARY CABIN CREW IS NOT KNOW BY RYANAIRDONTCARE CAMPAIGN BUT CABIN CREW HAVE CONTACTED OUR CAMPAIGN WITH €70 A MONTH BEING PAID AND UP TO €50 A MONTH SHORTFALL IN THEIR COMMISSION PAID BY RYANAIR. 6, RYANAIR ARE CORRECT UK RYANAIR CONTRACTED CABIN CREW DO NOT EARN LESS THAN THE MINIMUM WAGE. 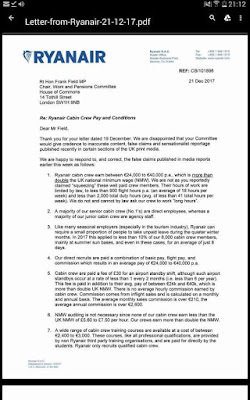 ON THE OTHER HAND CREWLINK /DALMAC'S WORKFORCE INTERNATIONAL CONTRACTED CABIN CREW DOING 8 HOUR AIRPORT STANBY SHIFT MAKES IT CLEAR LESS THAN £4 PER HOUR IS PAID, IF THEY ARE CALLED FOR A 1 HOUR LAST FLIGHT THEN IT EVEN LOWER. 7, TRAINING IS FERCILITATED BY CREWLINK /DALMAC WITH ALL TRAINERS RYANAIR EMPLOYEES. 8, CREWLINK / DALMAC'S WORKFORCE INTERNATIONAL CONTRACTED CABIN CREW OF 6500+ RENT THEIR UNIFORM AT €30 -£25 A MONTH. WITH UP TO A 60% OF NEW RECRUITED PROBATIONARY CABIN CREW BEING TERMINATED UNDERSTAND 12 MONTHS A TOTAL COST £300 -€340 IS PAID BY THEM. John said, RYANAIR HAVE TWO TYPES OF CABIN CREW CONTRACTS. 1,Ryanair Contracted Cabin Crew. 2,Probationary Cabin Crew Contracted through Crewlink Ireland & Dalmac's Workforce International. Ryanair's Chief David Bonderman and Ryanair's CEO Michael O'Leary in 2004 decided to make multi €millions out of Ryanair Pilots and Cabin Crew.Not only through Social Dumping, Exploitation and PAYE but through per hour rate of pay Flight Time. Two shell companies appeared Crewlink and Dalmac's Workforce International giving out Probationary Cabin Crew Contracted. Let's look at Crewlink only. Crewlink are the largest of the two with over 5000+ probationary cabin crew at Ryanair. Ryanair have confirmed their contracted cabin crew are paid per hour flight time €26.67 to €44.44 With a maximum of 900 hours flown a year. Crewlink Probationary cabin crew of 5000 x 900 hours flown a year = 450,000 hours flown. So 450,000 hours flown with flight time pay being €26.67 a hour =€12.1 million 450,000 hours flown with flight time pay being £44.44 a hour =€19.9 million Crewlink Probationary Cabin Crew pay. Crewlink pay Eastern Europe €11.40 to Dublin €16.40 per hour flight time. Ryanair pay Crewlink and Dalmac's Workforce International their contracted cabin crew pay per hour flight time of €26.67 to €44.44 Ryanair pay Crewlink/Dalmac's Workforce International €26.67 x 450,000 a year = €12.1 million Ryanair pay Crewlink/Dalmac's Workforce International €44.44 x 450,000 a year = € 19.9 million Crewlink/Dalmac's Workforce International Probationary Cabin Crew €11.40 x 450,00 a year = €5.1 million .... €7 million kept by Crewlink/DALMAC'S WORKFORCE INTERNATIONAL. Crewlink/DALMAC'S WORKFORCE INTERNATIONAL pay Probationary Cabin Crew €16.40 x 450,00 a year = €7.3 million .... €12.6 million kept by Crewlink/DALMAC'S WORKFORCE INTERNATIONAL. WHO DO YOU THINK OWNS CREWLINK ??????? The very same happens with pilots at Ryanair but MULTIPLE it by 4... Their are many ways to scam money off Crewlink /Dalmac's Workforce International probationary Cabin Crew at Ryanair with the help of their shell companies Crewlink Ireland and Dalmac's Workforce International that generate multi € millions a month with the per hour rate of pay scam being one of many. RYANAIR SHAREHOLDERS ARE NOT AWARE OF THIS. Ryanair is a maze to Audit and the high levels of termination among probationary Cabin Crew support this maze..... TIME FOR ALL TO BOYCOTT RYANAIR WHO ARE CLEARLY EUROPE'S BIGGEST EXPLOITER OF YOUNG PEOPLE.